Hyperboloids are generally used in optical telescope systems where good off-axis performance is an important requirement. Optical Surfaces supplied Hyperboloids have been at the heart of many deep space and earth observation satellites for many years. 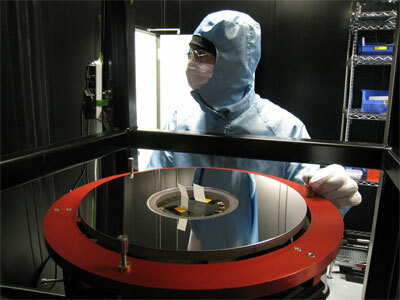 Optical Surfaces has established a worldwide reputation of being able to deal with the extremely tight tolerances and accuracy that these optics demand. Our company is proud to have supplied hyperbolic telescopes for many, very prestigious space projects, such as BNSC’s Top Sat, NASA swift explorer, ESA’s XMM and NigeriaSAT-2. Optical Surfaces Limited supplied the 2.5m resolution camera used in Surrey satellites (SSTL) Nigerian space agencies satellite NigeriaSat-2. Two 385mm, light weighted primary mirrors and two 142mm secondary mirrors were produced. Both sets of mirrors had a surface accuracy of better than L/20 P-V at 633nm and were matched together to ensure all the demanding tolerances in respect to focal lengths, conic constants and centering errors were met fully. The satellite was launched in August 2011 and the images demonstrate the instruments “stunning” high-resolution capability. The satellite will map the entire country in detail every four months and be able to help in such things as monitoring the effectiveness of fertilizer application. It will also complement its fellow Disaster Monitoring Constellation satellites by using its high-resolution imager to “zoom in” on areas of interest and determine if individual buildings are damaged, bridges destroyed or roads impassable.